US Vice President Mike Pence, left, speaks with South Korean President Moon Jae-in during a meeting at the presidential office Blue House in Seoul, Feb. 8, 2018. On the eve of the Pyeongchang Winter Olympic Games, the U.S. and South Korea vowed to work in tandem towards denuclearization of the Korean Peninsula, but delivered messages suggesting very different approaches in dealing with the threat of North Korea and its weapons development program. Ahead of a bilateral meeting with U.S. Vice President Mike Pence at the Blue House in South Korea’s capital Seoul, South Korean President Moon Jae-in addressed reporters Thursday, calling the Winter Games “all the more meaningful” because of the participation of high-level figures from the South and North, the U.S., and regional players Japan and China. “I believe that it is thanks to the unwavering principle of the United States and the very strong and close coordination between Korea and the United States that enabled North Korea to come out to dialogue and to participate in the Pyeongchang Winter Olympic Games,” Moon said. Earlier on Thursday, at Yokata Air Base in Japan, Pence said Washington would “continue to seize every opportunity” to ensure that North Korea does not use the Olympics to “paper over an appalling record of human rights and a pattern of developing weapons” that threaten the U.S. and the region. Moon, meanwhile, plans to meet with North Korean leader Kim Jong Un’s sister, Kim Yo Jong, and other senior officials from the North when they travel to South Korea to lead a delegation of 22 athletes and more than 400 entertainers and cheerleaders to the Winter Olympics. Kim made an eleventh-hour proposal to take part in the Games during his annual New Year’s address. Kim Yo Jong—who would be the first member of North Korea’s ruling family to visit the South since the 1950-53 Korean War—will arrive Friday to attend the opening ceremony of the Games, and will join Moon for lunch on Saturday, along with president of the North’s Supreme People’s Assembly Kim Yong Nam, according to presidential spokesman Kim Eui-kyeom. The decision to include Kim Yo Jong—who was promoted last year as an alternate member of the political bureau of the ruling party’s central committee—in North Korea’s Olympic delegation suggests Kim Jong Un may be trying to use the Games to better relations with the South and reach out to the U.S., amid crippling sanctions from the international community over the North’s weapons program. Kim Yo Jong is under U.S. sanctions for human rights abuses stemming from her role in the regime’s mass censorship activities. The North Korean and U.S. delegations are both expected to attend a reception hosted by Moon ahead of the opening ceremony for the Games, but North Korea’s foreign ministry has said there will be no meeting with Pence. 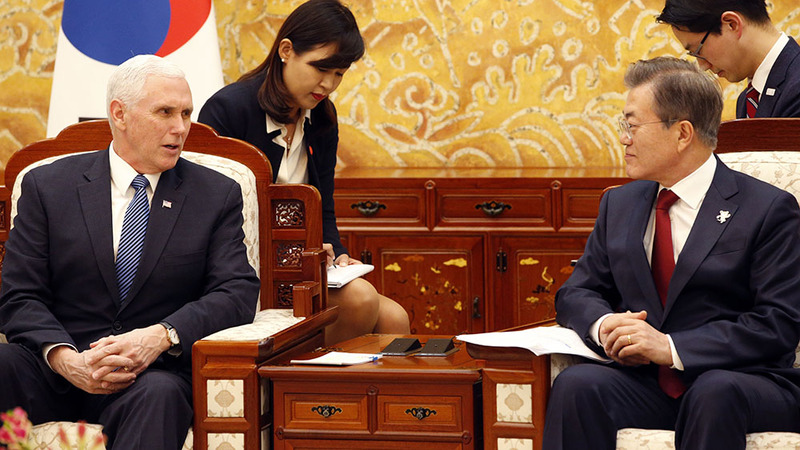 Kim Kwang-jin, a research fellow at South Korea's Institute for National Security Strategy (INSS), told RFA’s Korean Service that Pence has sought to show that the U.S. doubts North Korea’s intentions in using the Winter Olympics as a diplomatic channel to end its isolation. “The U.S. administration [of President Donald Trump] stands firm against North Korea,” Kim said. “The plan is to apply maximum sanctions and pressure, so it can be speculated that Vice President Pence’s stance would be on the same line, following President Trump’s talks with North Korean defectors,” he added, referring to a meeting the president held at the White House with eight defectors last week. Among Pence’s guests at the Winter Games will be Fred Warmbier, the father of Otto Warmbier—an American student who died days after his release from detention in North Korea last year. “Bringing Otto Warmbier’s family along highlights the nature of the North Korean regime and shows where the U.S. stands,” he said. By placing an emphasis on its poor human rights record, Kim said, the U.S. is providing another reason for the international community to apply pressure on North Korea. “The U.S. is already opposing North Korea’s development of nuclear weapons and intercontinental ballistic missiles, and U.N. Security Council resolutions have led to sanctions on North Korea,” he said. “[The. U.S.] is now raising the alarm that human rights violations in North Korea are serious. By highlighting this issue on the global stage, it is their plan to apply greater pressure on the North.